Criterion Games has announced it's next update to come to Burnout Paradise will be Codename: Cogney and will feature even more goodies than the last patch did. Anything that makes the online part that much more fun is great, Marked Man would probably be the most fun out of those three. Getting chased (or chasing) around Paradise City by a bunch of road rage driven crazy people would be a total adrenaline rush. Why don't you take a nice click on "Read More" to see what the other part of this post is like? You know, the part that actually corresponds with the title of the post. Then there's the latest announcement from the good folks at Criterion. The in-game custom soundtrack via the PS3's XMB. "Today, we're delighted to announce Burnout Paradise custom soundtracks will be coming to the Playstation 3 as part of our Cagney software update. 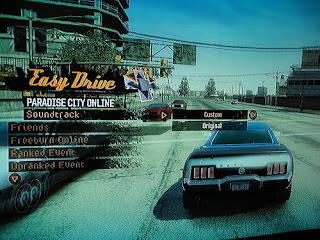 If you want to play your own music while in Paradise City, it's now possible via Easydrive without interrupting the game. This couldn't be simpler...you just hit the Easydrive menu, select Soundtrack and hit Custom. This brings up the XMB custom soundtracks page, where you can select what you'll play, whether you want to shuffle or repeat and group music." According to the Criterion website there's only 5 days left before the update, so hurry up Paradise addicts and get your in-game soundtrack properly mixed and painstakingly chosen. It's time to rock. Or rap. Or strum your banjo. Whatever sort of music you're into I suppose.